Lots of folks come to Chattanooga for a relaxing vacation. Others for outdoor adventure. But perhaps no group puts themselves to the test like those who come to Chattanooga to run, bike, and swim in a triathlon. 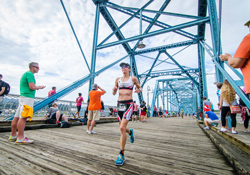 IRONMAN Chattanooga and other triathlons in the area bring some of the world’s best athletes to enjoy scenic courses and incredible competition in one of the sport’s top venues. Chattanooga triathlons attract a range of people from elite athletes looking to qualify for a world championship to first-timers hoping to finish the race—plus the thousands of spectators who come to cheer them on. The city has become such a strong triathlon town that it’s been chosen to host the IRONMAN 70.3 World Championships in 2017. But to race that, you need to qualify. Here’s just some of the races that you can do to see what all the fuss is about. 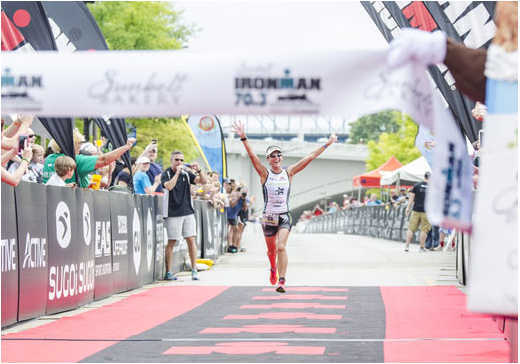 This full-length IRONMAN course will bring some of the country’s best to Chattanooga to compete for slot at the world championships in Hawaii. The race attracts more than 2,500 participants, and features a 2.4-mile swim, 112-mile-bike, and 26.2-mile run in and around the city. An all-day affair, the race starts at 7 a.m. with final runners not crossing the finish line until the final cutoff at midnight. From there, athletes jump on the bike, which features two scenic loops in rural Tennessee and north Georgia. They’ll be challenged with several mountain climbs but rewarded with spectacular views. Finally, the full marathon will showcase downtown Chattanooga, including the Southside, Riverview and the North Shore. Once again, the two-and-a-half loop course offers spectators plenty of opportunities to see the athletes. Seeing these athletes finish is something not to be missed. Click here for the best places to watch along the course. This year’s race is Sept. 25. 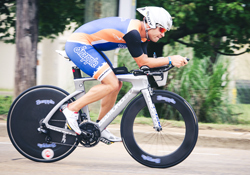 Half the distance of a full Ironman, the IRONMAN 70.3 Chattanooga in May still offers a significant challenge for any athlete. The race includes a 1.2-mile swim, 56-mile bike, and a 13.1-mile run, and features a similar course to the full Ironman in the fall. Since it started in 2014, this race has become one of the most popular half-Ironman races in the country. It also has the point-to-point swim in the Tennessee River, followed by a bike that includes spectacular views of Lookout Mountain and a rolling 34-mile loop into Georgia. The two-loop run course is through downtown and Riverfront Park. The next race will be held on May 21, 2017. It also serves as a qualifier for the 70.3 World Championships—which also will be held in Chattanooga for the first time in 2017. The two-day event will be held September 9-10, 2017. More than 185,000 athletes from around the world compete in over 100 different 70.3 races in an attempt to qualify for the World Championships. Of those, 4,000 are expected to journey to Chattanooga to compete for the overall title. 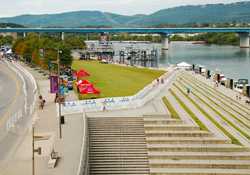 For athletes looking for a race that doesn’t take up most of the day, the Chattanooga Waterfront Triathlon in June offers two distances: The international includes a 1.5K swim, 42K bike, and 10K run, while sprint-distance athletes swim a quarter mile, bike just over 10 miles and run 3 miles. 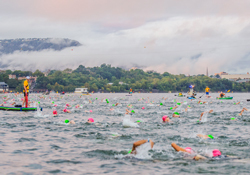 Like the above races, the swim in the Tennessee River goes with the current for faster swim times. The bike course is challenging with several long inclines—but you’ll enjoy a speedy ride down the other side of the hill. The out-and-back run course takes place mostly along the paved greenway of the Tennessee River. In 2016, the Chattanooga Waterfront Triathlon served as the Southeast Regional Championship for USA Triathlon.